I love pokemon and I think the concept of the games is genius having players capture and trade monsters with other players all over the world, but have you ever tried to figure out just what the hell pokemon actually are because I am pretty sure they are not the creatures everyone foresees them to be. I don’t recall this ever being explained in the countless animes that are still being made to this day and I’m sure fans have wrote many different theories of what pokemon are on the internet. Personally I dont have any theories of my own but have some ideas about what pokemon could possibly be. Before pokemon hit the TV screens there was another anime which was just as popular until pokemon became the greatest thing ever and that show was called digimon. Digimon which is short for digital monsters are packets of data which take the form of monsters which are used for both battling and to help people in general life. The size of a digimon has the same logic as a computer file size for example a small digimon would be a certain amount of mega bites, a larger digimon would be certain amount of giga bites etc. The reason I bring up this theory is because have you noticed that when the pokemon are sent out to battle or are returned to their balls they kinda get sucked in one pixel at a time and this could be because the pokemon are actually data packets and lets not forget that when they go to the pokemon center they are healed while they are inside their balls as if they are getting charged up like an electrical device. The best way I can explain this is by saying imagine that a scientist created a machine which could clone living creatures but they didnt want to test the machine on a human so they tested it on a mouse, during the cloning procedure something went wrong with the machiene and an electrical current was sent through the machine and because of this the end result was a mouse combined with electricity (Pikachu). This one is a little stretched but it could be something like this which could explain why pokemon are the way they are, that scientist could have then gone on to combine other animals with other elements creating the other pokemon. 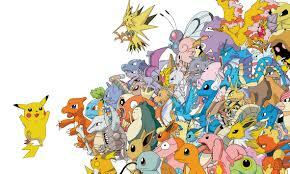 The idea of various animals being crossed with the different elements may seem like some kids imagination or an LSD trip to our generation, but wouldnt the idea of pokemon make so much more sense if the show was based in completely different dimenson to one we live in, for all we know pokemon might be based in another dimension and we just don’t know it. The reason this would make sense is because we don’t know what other dimension are like for all we know there could be an entire dimenion that consists of elephants living how we do today.